Dutch coach Mathieu Ceron teamed up with locals Valdimar Bjornsson and Eyþór Konráðsson to bring you this special report on climbing in Iceland. 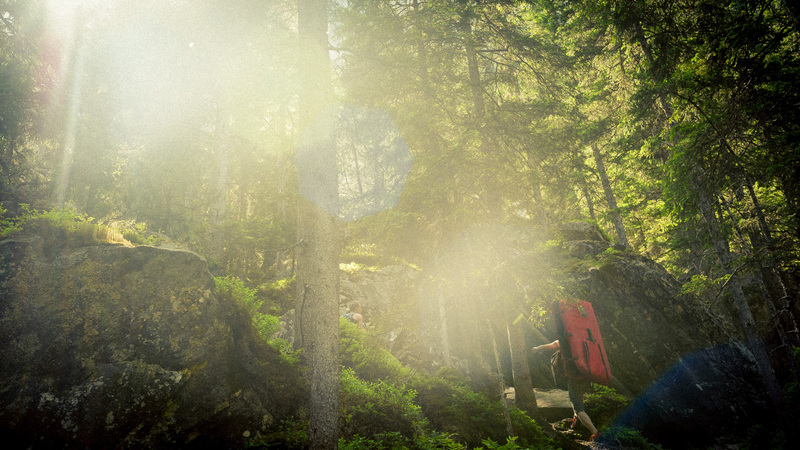 Read all about the best climbing areas, where to stay and what to do on rest days! 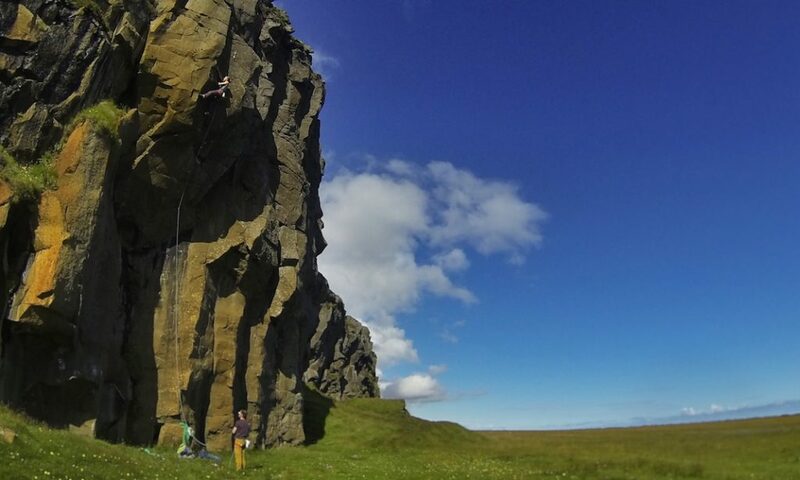 Iceland as a climbing destination is probably not the first thing that pops in mind when you’re planning your summer holiday. It might just be a place to consider though. If you want to escape overcrowded crags, enjoy breathtaking scenery and if you can deal with the sometimes harsh weather conditions then Iceland might be the place to go. There are regular flights going to Iceland from all over Europe. If you book the flight in advance the prices start at around 250 euros (depending a bit on the location you fly from). The main airport is Keflavik which is around 45 minutes from Reykjavik. There are also ferries leaving from Denmark to Iceland. They take around 3 days and you will arrive at the east coast of Iceland (SeydisFjordur). Iceland is located just southeast of Greenland. This far north, you should be prepared to experience severe weather conditions. The main reason Iceland is inhabitable is because of the Gulf stream brushing the south shoreline and the Rocky Mountains blowing the warm Atlantic air. This is wonderful, meaning that we can travel here all year. During the high summer you’ll find yourself having a great time hiking, climbing, touring around and enjoying a barren mountainous and often warm place. There is a catch though. You will have to expect and attend to the weather. Wind is the main factor, caused by high and low pressures and the Coriolis effect. Although it looks small on the map, Iceland is actually quite big. Driving from the east coast to the west coast takes you around eight hours. The ring road is the main road around Iceland and it is paved for most of it’s 1400 kilometers. You can get to a lot of places traveling around the ring road with just a small car. Renting a car is expensive but because of the distances you need to cover it is probably good to have one. Another option to get around the island is public transport. This system is well developed and hitchhiking is very easy as well. Reykjavik is the capital of Iceland and with roughly 120.000 inhabitants it’s by far the biggest city in Iceland. Although it is small, it has shops that are open 24/7 and there is much to explore. In the city center you’ll find a glass building called “Harpa”, which is an opera house but also used for a number of other events. You’ll also find plenty of restaurants and if you head out a little further to “Seltjarnarnes lighthouse” you’ll encounter a small hot tub to dip your feet into, which is a little secret. There is a nice bouldering gym called “Klifurhúsið” which is worth a visit. You can also find information about the climbing in Iceland and get your hands on one of the guidebooks. These websites offer great information to plan your trip: klifurhusid.is, klifur.is, 27Crags, mountain project, isalp.is. Hnappavellir is the biggest climbing area on the island. It is located 20 minutes to the east of Skaftafell. This is the place to go if you’re looking for vertical, technical, unchalked and cruxy sport climbing. The old basalt sea cliff is oriented southeast in a place named “Öræfir”. The crag is about four kilometers long with many different sectors. Vegetation consists of a big flat grassland which stretches all the way to the ocean. The next town east is Hornafjörður and in the west you’ll find Kirkjubæjarklaustur (have a go at pronouncing that). In Hornafjörður there’s a swimming pool, a grocery store, places to dine and a relaxed harbour. Try walking the paved path down the western part of town and you’ll experience quite a view. Hnappavellir has seen climbers for roughly four decades. Old school climbs are still going hard and classic. Fast forward to the modern era and there are now 145 bolted single pitch routes, 27 trad routes, about 150 boulder problems and some 5 ice climbing lines. 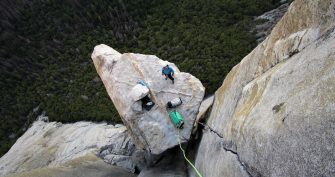 The YDS grading system is used, the routes range from 5.5 to 5.14a. 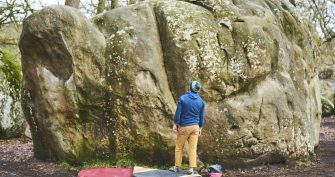 The majority of the climbing is graded from 5.10a to 5.12a and there are plenty of these routes, be aware that the grading here has been held to an old school standard and things can feel sandbagged. In the upper grade range you’ll find a large selection of 5.12’s and 5.13’s. 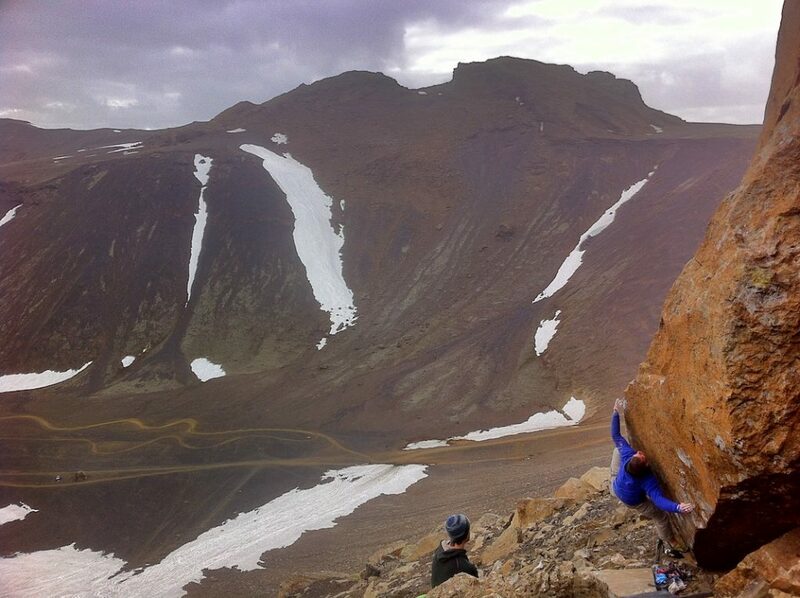 Ópus will be your prize, this route is the first 5.13d in Iceland (FA in 1996) and is still one of the toughest. The camp site is located at the Miðskjól sector. This is the first sector you arrive to after crossing the small river before reaching the main crag. There is a grassy low barrier to the right of the hut, this is the camping spot. The hut itself is locked except for climbers who have payed the annual fee of 1000 ISK (about 8 euro) to the bolt and access fund and the local farmers who allow us to climb there. If you’ve purchase the guidebook you’ve immediately payed the annual bolt fund. Hnappavellir is a farmland area, you’ll see horses, cows and sheep on grassy lands, some swampy places and a large sandy area with very sensitive nature. There’s a jeep trail leading left as the trail forks just after the first river crossing. Climbers were recently restricted from driving on this road. 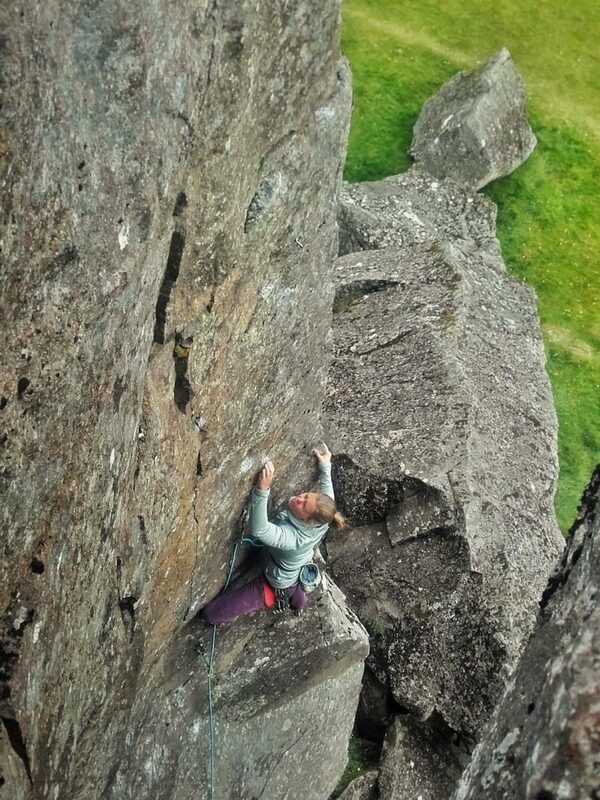 The climbing scene has grown in Iceland, with visitors numbers increasing as well. This means we have become more sensitive to the local land owners’ concerns. Be sure to get acquainted with the guidelines for staying and climbing in Iceland. However, all rock climbers are of course welcome to use the hut, as well as the campsite and theouthouse, provided they have paid the annual fee to the bolt fund. There are are many other things to do other than climbing in this area. Drive 20 kilometers east from Hnappavellir and you’ll see a glacial lagoon, it’s unmissable when your heading to Hornafjörður. 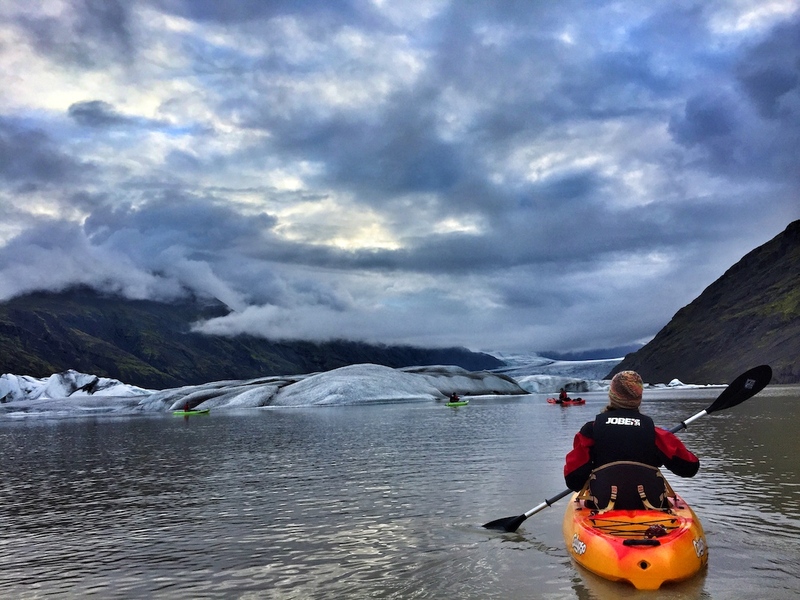 You can rent a kayak there and paddle between massive icebergs and say hello to some seals. 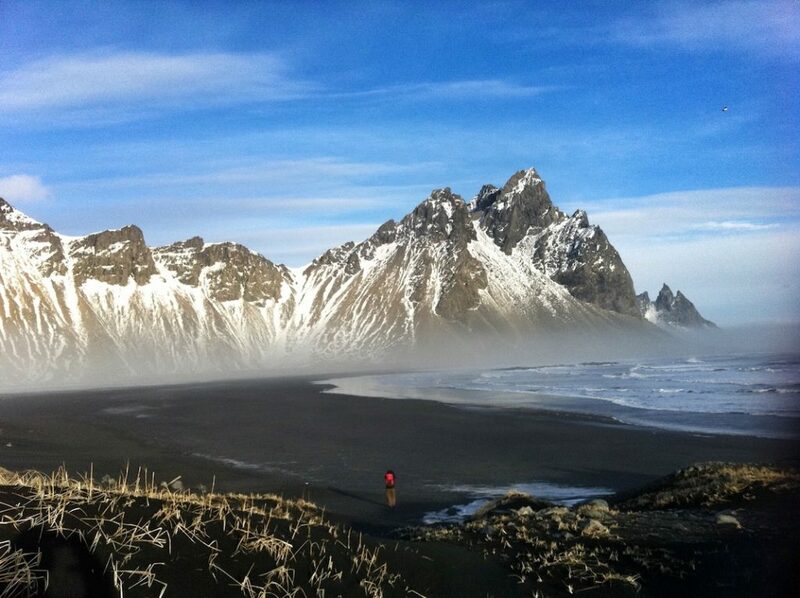 There’s also a beach to explore and the national park Skaftafell is just a few clicks west. 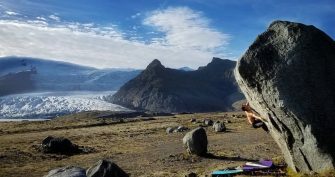 At Skaftafell you can go on all sorts of hikes or take a guided tour on Europe’s biggest icecap. There is another glacial lagoon closer to Hnappavellir called Fjallsarlon. 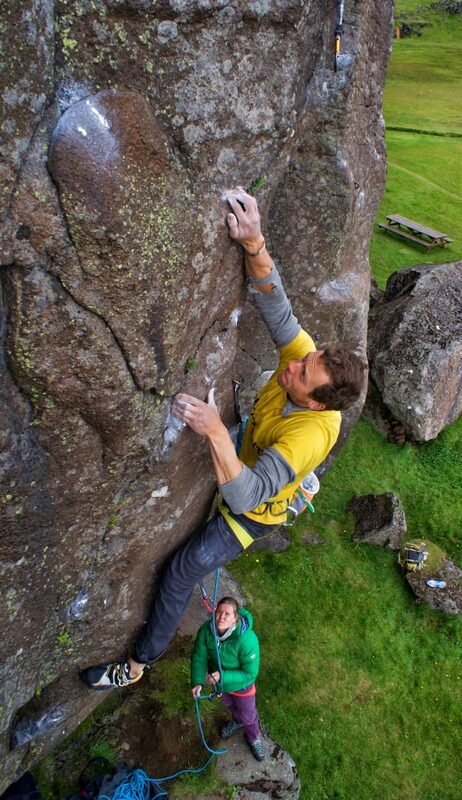 There you’ll also find some amazing bouldering. Although Hnappavellir is the best area for lead climbing, this doesn’t mean that it is the best place to go for all climbers in Iceland. If you’re looking try your hand at bouldering, then 15 kilometers east of Höfn you’ll find a newly developed area called Vestrahorn with over 350 boulders. This area used to be have a very active volcano, and it is very close to the sea. 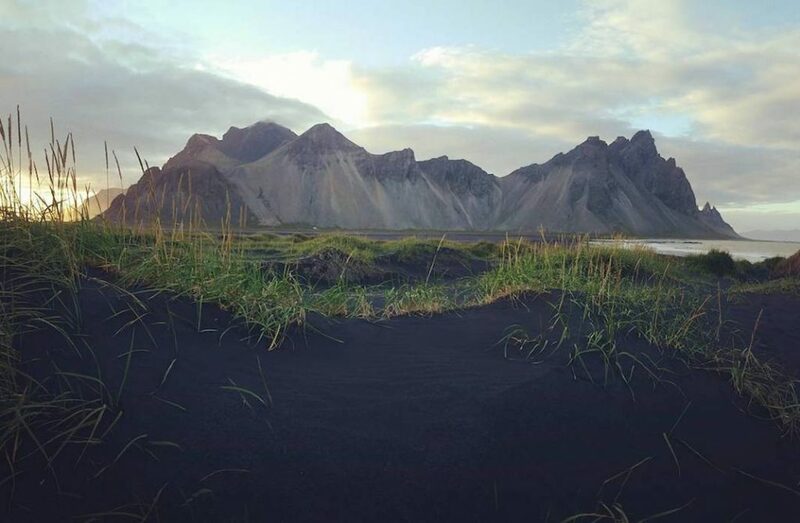 There’s a black sand beach called Kirkjusandur. The rock type is like no other in Iceland and of a scale not seen in other parts of the country. Gabbro is kind of like like granite, but not quite the same. The boulders are spread along the hills that abruptly end at the shoreline. Getting there: when coming from the west turn left 12 kilometers before Höfn and follow road 1. Take a right turn just before the tunnel (Almannaskarðsgöng), drive 6 kilometers on a dirt road until you see the Viking cafe on your left and what looks like a very large golf ball straight ahead (this is actually a radar station). In the Viking cafe you’re likely to meet the landowner, who has all the info about staying in the area that you could need. Because a topo has not been published yet, information regarding the climbing itself is limited. A beta topo is available, but the local climbers are putting together an official topo for the area. It should be finished this year. 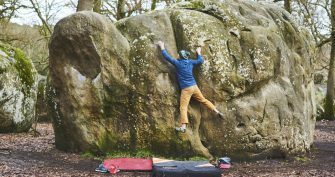 Most of the bouldering info can best be found through the climbers who have been developing the area. There is still room for doing first ascents because not all the rocks have been thoroughly explored. You can camp at the cafe, which offers a toilet and running water. Alternatively, you can stay in the cafe’s guesthouse. 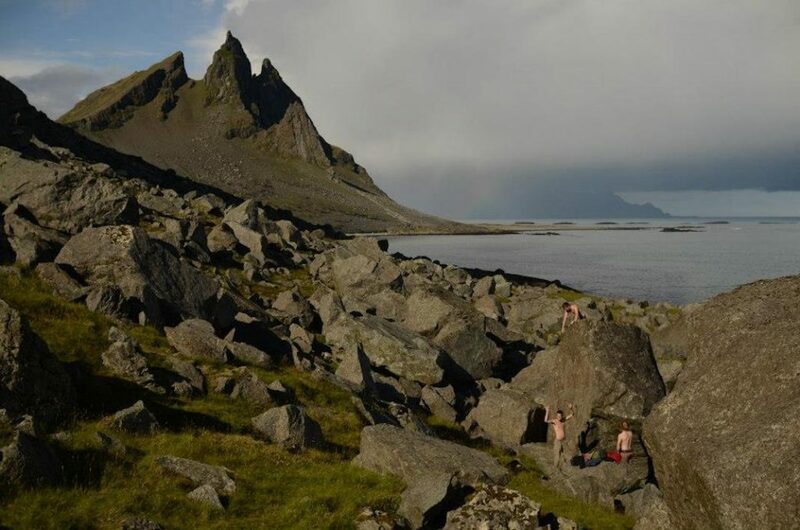 It is also possible to camp at the Herbúðir sector (no facilities just wild camping). In Höfn there are more guest houses and hotels to choose from. If you have a 4×4 jeep you’ll be able to drive all the way up to the climbing area. Driving a smaller car it’s best to walk from the cafe. The walk to the first sector which takes about 25 minutes. 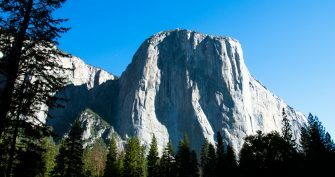 Climbing season is short here, from June through September, with August usually offering the best conditions. Being in Vestrahorn is quite special. The landscape is a lot different from the rest of the country, mainly because of the rock type. You can also take an awesome hike there, starting at the parking lot by the Viking cafe and going around Vestrahorn and Brunnhorn (which looks like a big Batman sign). The trail traverses past all the sectors and follows the shoreline. About halfway through the hike, you cut in behind the mountains and walk up behind them. You’ll reach a famous pass called Kex from where you’ll have a fantastic view of Kirkjusandur, the first beach you walked on at the start of the hike. In total the hike lasts about 14 kilometers and is of moderate difficulty. This area is located a mere 30 minutes drive from Reykjavik. You’ll need a jeep to get all the way or you could park at the motorcross area and walk a couple of kilometers. Good quality volcanic rock situated on a hill with roughly 50 boulder problems from 5 to 8A. This area is close to Hvalfjordur, about a 40 minutes drive from town. It offers slabby climbing in a single sector with a cliff height of 20 meters. The scenery is beautiful here. The grades range from 5.5 to about 5.12a. Sandbag grading does apply here. If you’re desperate to shred your fingertips after the flight then this is the closest place to climb from the airport. The English translation of ‘Galgaklettur” is hanging rock, which pretty much says it all. A parking lot is next to the cliffs. Grades range from 4 up to 7B+.